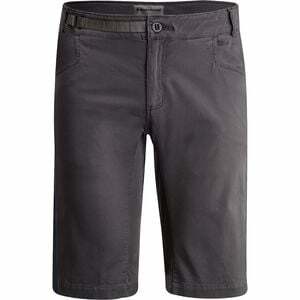 Product Condition: The Credo Short - Men's is in Excellent condition. These shorts were previously owned for three weeks. The following observations were made regarding these item. *They were used for an occasion. *There aren't any defects in them at all. *They got a little wrinkle, minor pet hair/dust, cleanable. *All items sold as is, all warranties void. Keep your knees covered with the Black Diamond Men's Credo Short when you're climbing slabs, chimneys, and multi-pitches with hanging belays. The stretch fabric resists abrasion without limiting mobility, and it's lightweight for a comfortable feel when you're climbing under the searing summer sun.